I submit my objection to the injustices of our nations drug policy, especially the incarceration of non-violent drug offenders. I state that my belief and actions henceforth in regards to the control of supposedly controlled substances will align with common sense, modern science, truth and reality itself. Via modern science and reporting it is now easy to discern that the war on drugs is a failure of immense proportion, a century of horrible lies and misfiring propaganda and that the majority of the harms ascribed to drug use are actually caused and exacerbated by the mechanism of the drug war itself. In recognizing the truth of this matter, I seek to be recognized as embracing rationality and common sense. 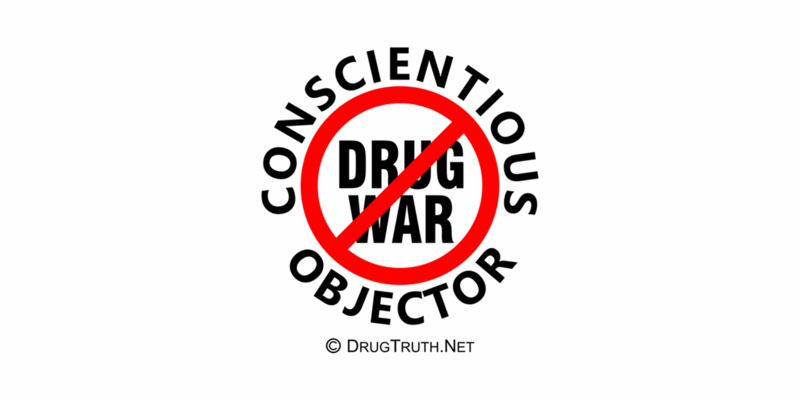 I therefore state that my conscience compels me to commit to ending the war on drugs. Drug war empowers our terrorist enemies brave enough to grow the flowers we forbid. Drug war enriches barbarous Latin cartels who corrupt and butcher tens of thousands of innocents each year with basic impunity. Drug war gives reason for existence to thousands of violent US gangs who entice our children to lives of crime and addiction to their ever more deadly drugs. Drug war means that addicts have no idea of the quality of drugs being sold which meant that 72,000 Americans died in 2017 because they did not know what was in the bags sold via the black market. Drug war mentality led us to craft new laws of mandatory minimums and add on penalties that have filled our jails and prisons and now, the supposed land of the free has become a gulag nation. Drug war has stolen basic American rights including the theft of billions and billions in asset forfeiture, and through the use of coerced informants and snitches. Drug war profits each year for criminals worldwide are estimated to be $370 billion and according to DEA spokesman Anthony Placido approximately half that amount is used to bribe judges, border guards, prosecutors and law enforcement officials. Drug war compounds and confounds justice, the medical industry, international relations and every neighborhood of America. Drug war confounds the ramifications of drug war and uses them as justification for more of the same. Drug war has supposedly been focused on controlling the so called controlled substances and yet after more than 100 years since the passage of the Harrison Act of 1914 the best places to score drugs are our nations High Schools and Junior Highs, followed closely by our nations prisons. There is no justification for this drug war, no benefit derived that even begins to offset the horrors we inflict on ourselves and the whole world by continuing to believe the drug war has reason to exist.